Adjective & noun. Obsolete except Scottish. Late Middle English. (A person who is) bedridden. Did you know that bedlar is a word for someone that's bedridden? I certainly didn't. Of course, being bedridden is no light matter, both for whatever illness or injury put you there and for the gravely serious consequences that such extreme immobility can cause. Discovering bedlar, however, lead me on a long and interesting ramble through the internet, reading about people that, at various times in their lives, were bedlars. 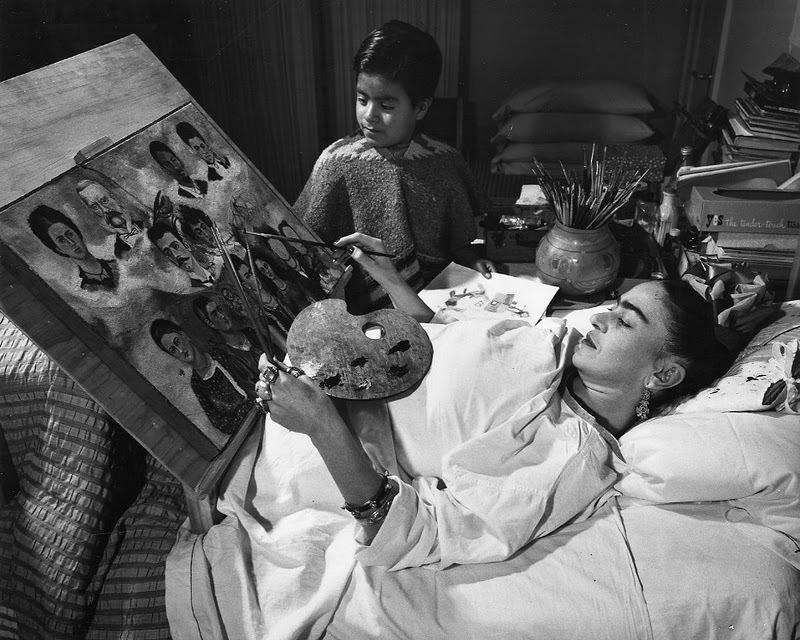 The Mexican painter Frida Kahlo (1907-1954), for example, was seriously injured in a traffic accident as a child and throughout her life was forced to spend months at a time confined to her bed. While she used that time to produce beautiful artwork (her mother made her a special easel for use in bed), there is an obvious reflection of pain and loneliness throughout her paintings. Other stories are singularly inspiring. Lisa Copley remained (voluntarily) bedridden for five months while pregnant with her twins in order to avoid a medical complication that could have caused her to miscarry. As a word, bedlar does smack of deep political incorrectness and so it's unlikely to ever regain common usage. As broad subject, however, in terms of what people can achieve while confined to their beds, it is profoundly interesting, inspiring and frightening in equal measure. Do you know of any other examples of great works performed by someone confined to their bed? Do you have any experience of it? Please feel free to share your comments below. I had never heard of that word before. Thank you! I had NO idea. I love the picture and the stories you told of these two brave women. Sis years ago, my foot was attacked by MERCA. I nearly lost my life. It was really close. The surgeon told my husband that he didn't know if I was going to make it. He also said if I had waited to go to the hospital for even an hour more, I would have lost my leg, my life, or both. I was in the hospital for 12 days and in a wheelchair for a month or so. I learned to do wheelies by the way (to the consternation of my children) It was hard not to be able to do the things I was used to doing. My foot and leg are fine--though I do have some pretty significant scarring. It was after that experience I began to do cloud painting. There are some samples of it on my blog. It was a life-changing time for me. I find the thought of being bedridden terrifying, which is probably why I spent so long reading about people that have been after I found 'bedlar'. I haven't heard of MERCA - it's similar to or related to MRSA, right? I'm glad that, save for the scarring, you made a full recovery; it sounds like you went through quite an ordeal. Maybe that isn't what you meant. Depending on one's views on Vietnam, John and Yoko's Bed-Ins for Peace might be considered great works in which they were voluntarily confined to bed. I can remember going upstairs, scooting up the steps on my behind. It was months before I was back to normal, whatever that means. (My brother once said, "Normal is the setting on a dryer.") What happened to me changed my life--my perspective of life and my appreciation for every moment I have--has been greatly heightened. Not quite in the same league as yours or the examples here, but I have a dodgy ankle and regularly go over on it while playing football (soccer). There are few things more excruciatingly, fist-munchingly painful. I feel a bit dizzy just thinking about it. I'm going to lie down.